Presentation of Jan Gehl's "Cities for People"
CANactions is pleased to invite you to the presentation of Jan Gehl's "Cities for People" in Ukrainian that will take place on 20th June at 19.00 at Derzhavna Naukova Arkhitekturno-Budivelʹna Biblioteka Imeni V.h.zabolotnoho. CANactions in collaboration with Osnovy publishing provided translation and publishing the Ukrainian version of "Cities for People" by Jan Gehl. For more than fifty years Jan Gehl has helped to transform urban environments around the world based on his research into the ways people actually use — or could use — the spaces where they live and work. The presentation of the book took part at the CANactions Festival on April 21 in Kyiv. Jan Gehl visited Ukraine for the first time and presented the "Cities for People" to the Ukrainian audience. 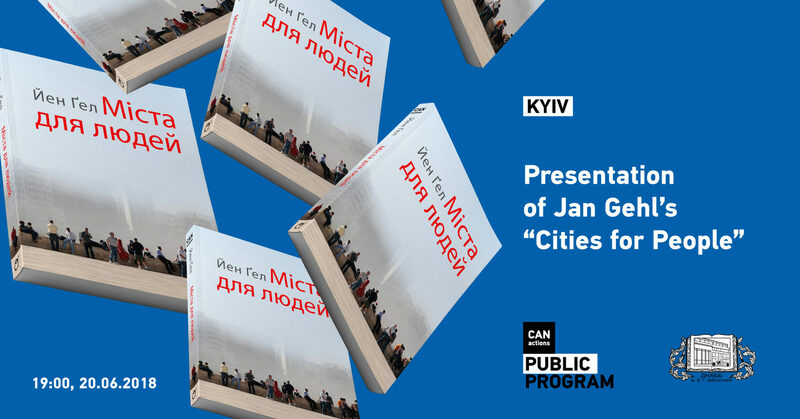 During the presentation on June 20, you could become acquainted with the Jan Gehl's bestseller, learn the history of creating the Ukrainian edition, take part in discussing the book, and also buy a copy of the "Cities for People". The book will be useful to experts in the field of urban planning, civil servants and everyone who is interested in the problems of cities and approaches for their solution. This book, like no other, promotes the issues of modern urbanistics among professionals and a wide audience.